It was a cool and pensive night on the Copper Belt in the Zambias. At a quiet well-established lodge, lush with natural flora and fauna, as well as exotic orchid and cycad landscape installations, Sherbourne Lodge is a regular overnight retreat for consultants and other visitors to Kitwe. This was the location of the SAIMC Zambia Annual Banquet. 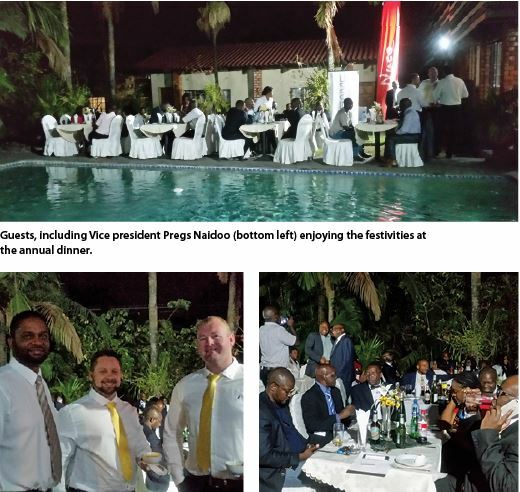 As the voice of automation and instrumentation, the event was graced by over 45 guests from various mining and technology entities operating in Zambia, namely; Electrical Instrumentation Services, Trescha Electronics & Computer Systems, Neelkanth Cables, Afrilek and Vega. They were joined by various individual SAIMC members, mostly engineers from the mines. Guests were delighted by the presentation of traditional Zambian cuisine such as fresh goat meat from Lufwanyama area, which was heralded by the jovial Tresford Siame, did a fine job as MC for the event. We were pleased to have the support of SAIMC vice president Pregs Naidoo, who presented a technical analysis of the opportunity for sector growth and development with regard to the theme ‘Automation the key to industrialisation in Zambia’. The president of the Engineering Institute of Zambia also presented on the same theme from a Zambian perspective, and encouraged all engineers to make their voices heard by ensuring that they are registered with legitimate organisations such as SAIMC Zambia, which can lobby for their interests. But it was not all technical talk and presentations. In the spirit of the beginning of the start of the holiday season, there was a casual atmosphere filled with progressive music and classical jazz favourites, rounded off by a raffle draw, which saw a guest sauntering off to enjoy a spa and massage, much to the envy of other members. On 6 November, Foxboro held a technical presentation for Instrumentation Diploma students at the Northern Technical College, in Ndola. The theme was ‘Internet of Things using wireless devices’. The Foxboro team was led by Johan van Jaarsveldt and included Dewin Sadie and Kobus Vermeulen. In welcoming the Foxboro team, SAIMC Zambia chairman, Enock Shikabeta, expressed happiness at the desire by Foxboro to reach out to the students and share the latest technology trends. 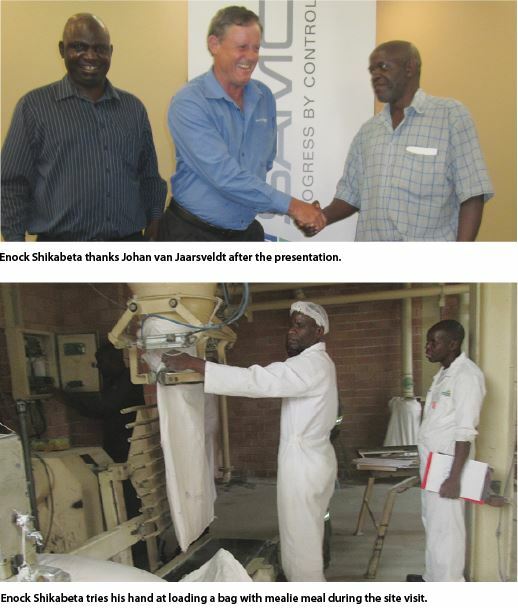 On 20 November, SAIMC Zambia members visited Mpongwe Milling’s plant located in Kitwe. The facility produces mealie meal and flour for the Copperbelt region.